When it comes to food, most bowling alleys strike out. Ardent keglers are subjected to such catastrophic “cuisine” as perpetually rotating hot dogs seared to a leathery sheen under a heat lamp inferno, soppy messes of nachos bathed in gloppy processed cheese topped with gelatinous jalapeños and greasy onion rings with the texture of fried rubber bands and as oily as well-slicked lanes. Getting something edible at most bowling alleys is as tough as picking up a seven-ten split. Visitors to the historical Fourth Street bowling alley will notice colorful signage on the exterior north-facing wall of the yawning complex and might initially attribute it to some of the city’s very creative taggers, but it’s not some gang named Ezra’s staking its territory with graffiti that’s at work here. Ezra’s Place is the second Fourth Street restaurant venture of the phenomenal chef Dennis Apodaca, braintrust behind Sophia’s Place, one of the city’s very best restaurants. Ezra’s Place is named for Dennis’s son, a well-mannered teenager who helps out on weekends. Sophia’s Place is named for Dennis’s daughter so if the naming conventions formula holds true, he probably won’t open another restaurant since he’s only got two children (and a lovely step-daughter who also helps out at both restaurants). Ezra’s Place is antithetical to Sophia’s in terms of seating capacity. While Sophia’s is tiny and crowded, Ezra’s is capacious. Ezra’s Place launched in late September, 2008, but the word got out quickly and it wasn’t long before Dennis’s dining disciples made the pilgrimage almost directly across the street from Sophia’s. It’s not only the seating area that’s capacious. The kitchen at Ezra’s dwarfs the confining kitchen at Sophia’s (although as Guy Fieri said, “little place, huge flavors.”) As a result, Dennis has been able to expand his menu and feature even more of the creative and funky, New Mexican influenced dishes that have garnered him acclaim as an Über chef. He’s also been able to expand hours of operation and serve dinner five nights a week. Ezra’s Place is open from 11AM to 9PM Tuesday through Saturday and from 9AM to 2PM on Sundays. As at Sophia’s, the ambiance at Ezra’s is colorful and interesting. Unframed and very colorful paintings festoon the walls. Most, particularly those of anthropomorphic dogs will have you do a double-take in an appreciative sort of way. The restaurant is situated on a second level of the brightly illuminated bowling alley, but the sound of pins crashing down is muffled by distance. What you’re more likely to hear are compliments to the chef and utterances of sheer enjoyment. The Saturday and Sunday brunch is like a “best of” from among some of the wonderful specials with which Dennis tantalized taste buds at Sophia’s. There are only about a dozen standard items on the brunch menu plus the special (in every sense of the word) pancakes and scrawled on a slate board near the entrance are brunch specials, some of which I don’t recall ever seeing at Sophia’s. Because brunch means breakfast and lunch, you can also order from the expansive lunch menu, adding another dozen or so options from which to choose. We had the pleasure of sharing our inaugural brunch at Ezra’s Place with Sandy Driscoll, our friend from Los Angeles. Brunch is best with friends like Sandy who have sophisticated palates and a great sense of adventure–friends from whose plates you can sample, friends who won’t order the same thing you do. It allows for trying more of the menu and comparing notes on what’s good and what’s not as good. We didn’t find anything at Ezra’s for which the adjective “good” would suffice. Everything started at “great” and got better from there. Greatness would certainly be ascribed to the fried calamari with the house dipping sauces. Each whisper-thin, batter-coated ringlet is surprisingly fresh with the perfect texture that’s neither too chewy or too crispy, but a balanced medium. Two sauces accompany the calamari. The first is a Balsamic reduction with equal pronouncements of sweet and tangy. This one is so good that I tried it with pancakes and it passed muster. The second is a jalapeño Ranch dressing. This one has a piquant bite to it, but also a hint of dill. No doubt Dennis made these dipping sauces from scratch as he’s apt to do with most things on the menu. In New Mexico, chips, salsa and guacamole are the three amigos people most want on their dinner tables. The chips are homemade and served warm. They’re also thin and low in salt, a healthful, delicious combination. Neither of the salsas–a roasted tomato and chipotle salsa and a salsa fresca akin to a pico de gallo–are particularly piquant, but both are very flavorful and tend to complement rather than dominate the flavors of anything to which they are added. 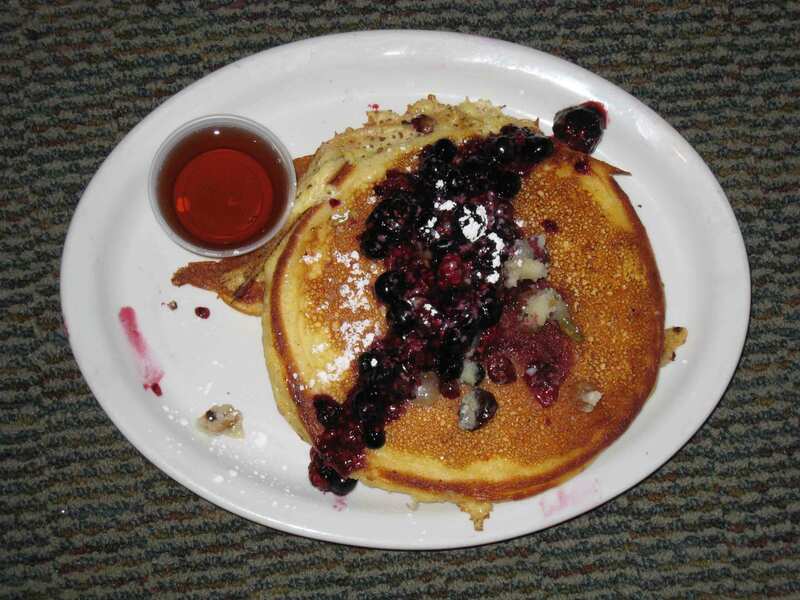 The special pancakes of the day is a brunch tradition at Sophia’s Place and it continues at Ezra’s. With any luck, you’ll visit Ezra’s when the featured pancakes are the ricotta and lemon pancakes with a piñon butter topped with fresh berries. The tartness of the berries and lemon create a palate pleasing harmony with the maple syrup (yes, the real stuff). The sour cream changes the texture of standard pancakes by adding moistness while retaining the fluffiness inherent in great pancakes. Some of the aforementioned specials which sometimes graced Sophia’s menu are standard offerings at Sophia’s. 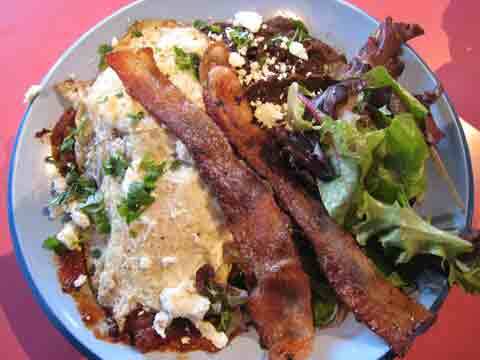 One such special at Sophia’s but standard at Ezra’s are the chiliquiles with red chili-roasted tomato sauce served with black beans and two long strips of crispy bacon. Chiliquiles are an interesting dish, seldom prepared the same way by different cooks. Dennis’s rendition holds true to some of the dishes traditional aspects, but being the maverick (eat your heart out John McCain) he is, he also imparts his own creative flair into what is otherwise a simple dish. The basis of chiliquiles are soft tortillas on top of which eggs (any style) are added. In Dennis’s version, the chili-roasted tomato sauce is actually layered below the eggs which are topped with queso fresco. This dish truly brings with it an explosion of flavors, textures and contrasts–the medium piquancy of delicious red chile, the acidity and tanginess of a homemade tomato sauce and so much more. It is a very enjoyable entree. A chile relleno trio sure to tantalize your taste buds starts with chilaca chiles, a mild to medium-hot chile with a rich flavor. Fully mature the chilaca chiles have a dark greenish or maybe even dark brown appearance. When dried, these chiles take on a dark, wrinkled skin and are known as pasilla chiles. What Dennis does with the chilaca chiles is akin to culinary wizardry, stuffing them three ways. One is stuffed with black beans refried in duck confit (a flavor escalation that places the beans in rarified company as some of the very best I’ve ever had). One is stuffed with tomatillo and one with a roasted tomato and red chile sauce. All three are topped with goat cheese and Asadero cheese then drizzled with a creme fraiche. From the lunch side of the menu, you might want to try the Poblano chili relleno with calabasitas, Asadero cheese and tomatillo sauce. The poblano has slightly more piquancy than a bell pepper, but when roasted properly imbues the qualities of freshness and fruitiness to an entree. This is a poblano on steroids, a corpulent pepper engorged with fresh calabasitas and Asadero cheese. The tomatillo sauce is a Dennis Apodaca specialty, one which he demonstrated for host Guy Fieri on Diners, Drive-Ins and Dives. The tomatillos are grilled and blackened while Dennis prepares the foundation for the sauce (onion, garlic, chipotle adobo and pure honey). He then adds the tomatillos to the mix and allows them to simmer for a few minutes before blending the entire amalgam then reducing it. This is a spectacular sauce with a lot going on. One of the seemingly de rigueur offerings at many inventive Southwestern restaurants in New Mexico is duck quesadillas, a very good idea not always executed well. For me, the standard has always been the Coyote Rooftop Grill in Santa Fe. It shouldn’t surprise me that Dennis does them better. The duck is as tender as a bird’s heart with none of the gaminess and fattiness of duck at the hands of chefs who don’t have Dennis’s skills. He’s generous with the duck to which he applies a sweet-savory barbecue sauce wholly unlike the vinegar-tomato sauce you’ll find at barbecue restaurants. The tortillas are browned to a nice crispness and have the brown spot appearance of a pinto pony. Served with the quesadillas is a fresh salad, a hallmark of Dennis’s restaurants. Ezra’s salads are always crafted with fresh, crisp greens and a subtle dressing that marries well with the greens so that their flavor is what you get with every forkful, not some sweet or tart flavor suppressor. The quesadillas also include a fresh pico de gallo and some of the very best guacamole in America. The guacamole has a nice lime and cilantro infusion to complement the buttery richness of fresh, creamy avocado. Sophia’s was home to my favorite pastrami sandwich in Albuquerque. Ezra’s one-ups Sophia’s with a grilled Ezra pastrami sandwich. Lightly toasted Sage Bakehouse sourdough bread is the canvass on which sauerkraut, pastrami and homemade Thousand Island dressing imprint their deliciousness. Rather than masking the flavor of sauerkraut as some restaurants do by sweetening it or saucing it highly, Dennis allows the sauerkraut to be sour–not lip-pursing sour, but with a definite tang. The Thousand Island dressing is thick, rich and somewhere between sweet and sour. This sandwich is served with a mountain of Ezra’s fries, julienne fries that are one of the restaurant’s most popular draws. In its annual Food & Wine issue for 2012, Albuquerque The Magazine awarded Ezra’s a Hot Plate Award signifying the selection of its julienne fries as one of the “most interesting, special and tasty dishes around.” Considering the thousands of potential selections, to be singled out is quite an honor. 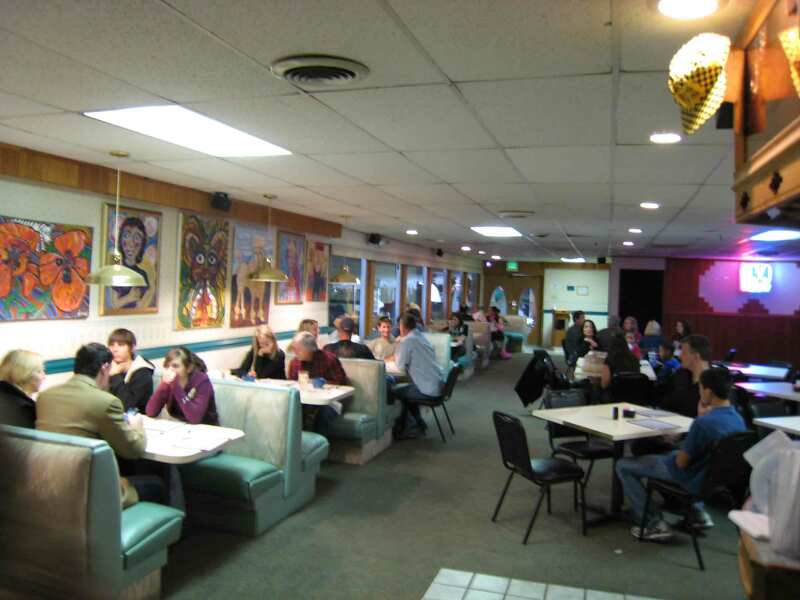 On October 23rd, 2011, the New York Times travel section celebrated “36 hours in Albuquerque.” The article was perhaps a revelation to residents of Metropolis who may not be cognizant of all there is to see and do…and eat in the Duke City. Likening the “lush farmland” “along the banks of the Rio Grande” to a “quiet oasis,” the Times indicated those farmlands provision the city’s “vibrant organic movement” with “heirloom beans, corn and more.” The Magazine praised the “bowling alley location, farm to table produce and a chef-owner with Chez Panisse credentials” at Ezra’s as adding “up to hipster overload” anywhere but Albuquerque. The aforementioned Sophia’s is one of a handful of restaurants in Albuquerque I believe can compete in larger, more culinarily sophisticated markets. Ezra’s, if possible, could be even better. That’s because Dennis Apodaca now has a bigger canvas for his art, a more expansive venue in which to display his vast talents. Ezra’s Place is temporarily closed to repair some damage caused by a fire. Possibly reopen early- to mid-August. I stopped by Ezra’s yesterday and it was still closed. We then went in Sophia’s and we’re told the closing was permanent. I stopped by Ezra’s for lunch today. It was closed, and the sign with their hours was gone. Someone from the bowling alley said they started moving stuff out yesterday. The cashier at Sophia’s (my fallback option) knew nothing about the situation. Anybody have any inside information? I’m hoping they’re just relocating; losing Ezra’s would be a tragedy for Albuquerque diners. Thanks for another wonderful recommendation! I went here for lunch and took two out of town guests. The food was delicious and the service was good. I will definitely go back! Congratulations on your wonderful blog. I’m definitely going to try many of your recipes. Thanks, Gil! I moved to Albuquerque a year and a half ago and your blog has been a great reference when checking out new restaurants! Update as of 5/22/2011: Unfortunately after eating here multiple times probably 10-12, we have decided to pull the plug on eating here any longer. The food used to be just EXCELLENT, the past three visits have not only left us disappointed, but also a little angry and very bitter. Now don’t get me wrong, we LOVED this place for quite some time and it is sad to see it in the shape it is in. On today’s visit our beans were so salty that we could not even touch them, on top of them being completely cold. They used to have some of the best pintos in town. We normally would order a side of beans and a side of bacon for our little one. It would come out as a nice bowl of beans and a side of bacon on a plate for $5.00. Today it was a cold scoop of wicked salty beans and one piece of slightly undercooked bacon for $4.50. THEY HAVE ALSO REMOVED THE EZRA SANDWICH, which in my opinion was one of the top 5 sandwiches in town, such a bummer to see this sandwich go. On our second to last visit the steak in the steak sandwich was nearly inedible, such was the case with the skirt steak in the tacos at Joes. So sad to see this as Ezra’s used to be a weekly highlight for our family. Perhaps in the future if things get back to normal we will try again. I’ve been a big fan of Ezra’s, but my last few visits have left me wondering if the place is on the decline. My entire life, I’ve sent a dish back to the kitchen maybe two times, and I’ve had to send dishes back two times now at Ezra’s, because I literally could not eat them (one was the ribeye, which I ordered medium rare, but came out blue, cold and raw, and the other was the scallops, which also came out completely raw and cold in the middle). Really, every time I’ve visited there’s been one thing that was slightly off, either with the service or the food, but I’ve always given it a pass because when the food is good, it’s very good. I just wonder if Dennis is overextended with three restaurants, and quality control has gone by the wayside. Went on a Saturday night at 6pm and had to wait 20 minutes for a table. I had the salmon and my dinner companion had the kobe burger. The salmon was average — nothing out of the ordinary but tasty enough. The burger was juicy and good. The bun was a nice upgrade from a Rainbo bun. The night I was there they had live music. Don’t go there for the high-style atmopshere — go there for a good meal. My husband and I went yesterday for a second visit. We enjoyed a delicious dinner with 2 other couples. All six of us thought the food and service were great. I have eaten in some outstanding restaurants throughout the world, so Jace’s opinion, does not apply to me. And yes, the best pastrami sandwiches will always be found at a NY deli!! The number’s disconnected. Did it close? I just called Ezra’s ((505) 344-1917) and confirmed that it’s still open. Dinner is from 5PM – 9PM and lunch runs until 3PM. Sad to agree with the recent reviews that the service was atrocious. The room was less than 1/2 full with one large table of 12 or so getting served. However, we waited ten minutes just to get menus and then figured we had better order entrees only as we were rather ready to eat. Another 45 minute wait until served. It was good, but hopefully someone who knows the owner will tip him/her off that this is not the way to get repeat business. If Sophia’s is closed for dinner, why not import more staff to Ezra’s in order to avoid such deadly delays. My first and last time eating at Ezra’s was horrid! The soft shelled crab sandwich was the worst looking and tasting thing I’ve attempted to eat in a long time. The waitress was extremely rude when I told her I couldn’t eat the sandwich and the chef even made an appearance asking what my problem was. Really? Come on. The food looked like something you’d see on an episode of Sesame Street and tasted like deep fried crab shell—minus the meat! I will never waste my time and money at Ezra’s, again! Where is this new restaurant going to be located on the west side? The restaurant was planned to be located in the Cottonwood Place shopping center just north of the Cottonwood Mall. It was to be located in the site of a former Quizno’s. It’s been a while since I’ve spoken with Dennis so I don’t know for sure what progress has been made. My first trip to Ezra’s did not produce high praise so a few weeks ago I went back for the Pastrami. Sure enough the pastrami was the second best I ever had and the homemade thousand islands dressing was wonderful. The negatives, however, made me wait and think before writing further comments. The pastrami came with a choice of salad or fries. Unfortunately I chose the fries which I would rate as a drippy, greasy, belly churning mess. I know that the salad is very good however. Grilling the Rueben also produced a grease impregnated sandwich which overwhelmed the pastrami. I realize that many love a dripping excess of the greasy stuff (how else can you explain chicken fried steak or chicken fried chicken) but one 2am red light flashing trip to the cardiac catheterization lab changes your outlook toward this and in a surprisingly you adjust and find it revolting. Next time I will order this with a side salad & plain rye bread & I am sure that I will like it. I think so many people who are Albuquerque natives and haven’t really traveled out of state have no idea what really good food is all about. I have eaten my way around most of the country and the world and Ezra’s was just ok for me. The food was average, the service was poor and the restaurant had the charm of eating in the back of a dollar store. I seem to have been hitting your favorite places these past couple of weeks. At Ezra’s for lunch I had the scallop tacos. I thought the little salad was excellent and the taco was a drippy, messy ok. Everything seemed to have an unnecessary coating of oil. Obviously the place completely lacks charm but I will come back to try the pastrami. I thought most pastrami in ABQ was decent until we stopped at Katz’s Deli in NYC a few weeks ago. This convinced me that everything I had ever had was crap so I am eager to try Ezra’s version. Based on my one visit to Ezra’s though I am confused about all the praise I have been hearing for it. It is decent but I wouldn’t rate it above an 18. Another visit may change my mind. I have been to Ezra’s on three occasions now and I have raved to every friend I have about the place. On my first visit, my son and I both had Ezra’s steak sandwich and we each came away thinking we’d had the best sandwich of our lives. My second visit was with a co-worker and we both had the special soft-shelled crab sandwich. I couldn’t say it beat the steak sandwich, but it certainly matched it. Then, on my third visit, my son and I again ordered the same. We had Ezra’s Kobe Burger with blue cheese. We were simply stunned. My son doesn’t like blue cheese, so he ordered his with asadero. I have no idea what his was like, but I cannot stop myself telling anyone who will listen that I have now had the finest burger of my entire life. And I say that full in the knowledge that the thing doesn’t even have green chile! On my next visit, I plan to have the pastrami sandwich mentioned above. I have strongly considered it each time I’ve visited, but I’ve always opted for other menu items. Besides, I’d had the pastrami at Sophia’s Place and felt I’d already found the best pastrami sandwich in Albuquerque. Now, on your recommendation, I know I will not opt out of the pastrami on my next vist it Ezra’s. And finally, thank you for this site. I love it! And by the way, what the heck happened to Dos Amigos / Mis Amigos? Are they gone for good, or simply moved again? Excellent breakfast with surprisingly good and strong coffee! My wife and I were on vacation in Albuquerque at the end of March and had the pleasure of eating at Ezra’s Place several times. We live in the Bay Area of California (my wife works in Berkeley and I in Oakland), so we have everyday access to a variety of funky and world-renowned restaurants, but what interests us most are quality ingredients and good flavors. We loved the food here. For lunch, we shared two of the specials of the day – lamb tacos and duck quesadilla. The duck combined well with the melted cheese, and the grilled tortilla added taste and texture to the dish. The lamb tacos were equally good. Small touches, like the freshness of the salsa and the lightly dressed field greens, complemented the entrees. The following day, we came for breakfast and ordered the special pancakes. We were told that we’d have to wait at least fifteen minutes while they made some new batter. We would have been willing to wait longer to get our lemon and sour cream pancakes with the freshly made butter. They were excellent. Before I start sounding like a food snob (maybe too late), I should say that we don’t go to many of the well-known restaurants of San Francisco because we don’t care about the reputation of the restaurant: we only care about the food. If you haven’t been to Ezra’s Place yet, you need to go. When you find a chef like Dennis, you need to support him because he obviously cares about the food. Went to Ezra’s for brunch yesterday and I have to agree with the above poster about the bad service. The quality of the food ALMOST made up for it, but the coffee was really really bad and that brought them back down to ” We’ll try it one more time and see if the bad service/coffee was just a fluke” level. Our waiter spent much more time eating his own breakfast in plain view behind the bar and texting on his cell phone as he did working. If this was Ezra, he needs some lessons from Dad on how to spend his time in the restaurant. Food was ok, everything was very greasy. Service was HORRIBLE!! We could not have been more disappointed. We’re never going back. So if you want so-so food and crap service try Ezra’s Place. Thanks for your excellent website, Gil. The phone number for Ezra’s Place is actually 344-1917.